Quality in every sip: Davidoff Café Crème. The secret of outstanding coffee lies in quality, care, and composition. That is why at Davidoff only the finest beans are carefully selected by knowledgeable experts. 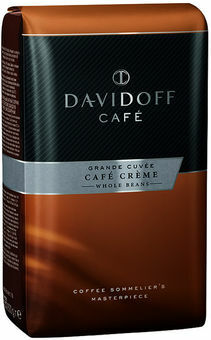 These beans are then roasted to perfection to create Davidoff Café Crème. This exclusive and harmonious blend of the highest quality Central and South American highland coffee beans ensures an outstanding cup of coffee each and every day. Its unmistakable aroma, golden brown crema, and full-bodied flavour are pure indulgence for the senses. Davidoff Café Crème beans are selected by the finest coffee sommeliers who utilise their years of experience and knowledge to craft a truly outstanding blend. The beans are slowly and carefully roasted to a full intensity and in a way that allows the maximum amount of aroma and flavour to come through.